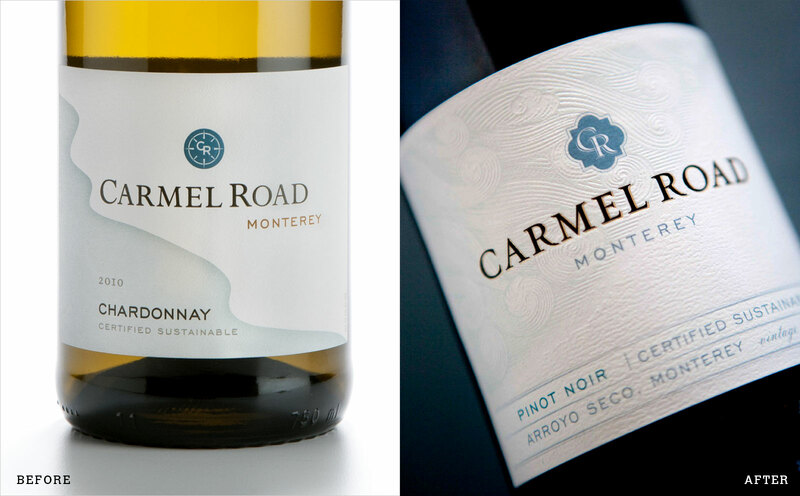 Carmel Road: How does an established brand with good distribution dramatically evolve its package design without losing loyal consumers? Our redesign for Carmel Road retained equity while increasing premium cues – and the imagery now tells the brand story. Our goal was to retain equity from the existing package while better conveying the brand story which is rooted in its Monterey provenance and sustainable practices. Additionally, the brand needed to have a more high-touch, handcrafted feel. The foggy Monterey climate creates ideal growing conditions for these wines. Our illustration of fog swirling in from the upper left and the cool blue/gray palette convey this climatic influence. We retained the blue palette for continuity, but evolved the CR emblem to reflect the California mission style architecture of the Central Coast, and used heavy embossing to give the paper handcrafted appeal. 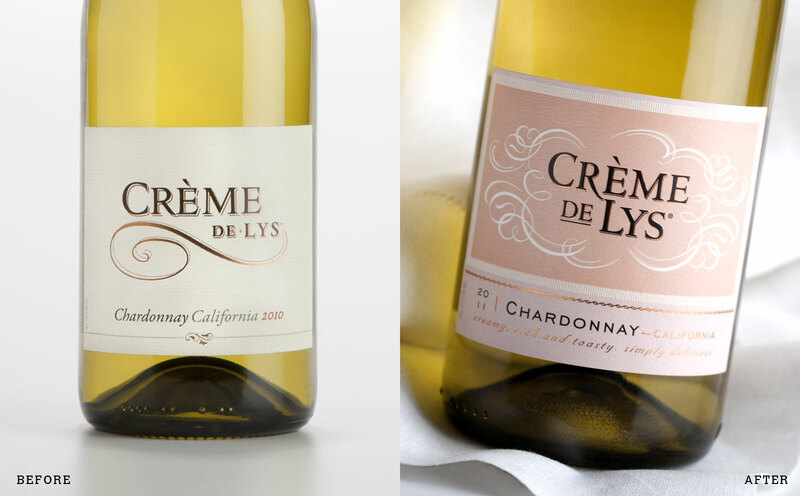 Créme de Lys: This brand was doing well in market, but the client saw an opportunity to increase its momentum with a more unique and evocative package design. Diageo asked us to evolve the label to better convey the rich, creamy flavor profile of the wine, and connect emotionally with the female target consumer seeking a delicious treat. We also needed to improve the branding so that the name reads as a continuous whole without confusing consumers who know the brand. And most importantly, the brand needed a distinctive look and feel to set it apart from competitors and stand out on shelf. Our French bakery-inspired color and border detailing convey the indulgent flavor profile, while also differentiating the brand and giving it shelf pop. We re-imagined the existing swoosh as whipped-cream-like swirls that surround the brand, communicating creamy taste. Our new logotype has improved readability and a ligature between the R and L for an ownable brand mark.